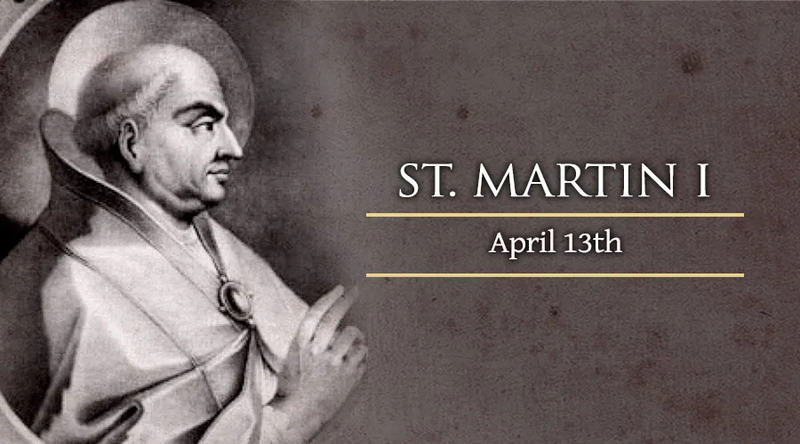 Catholics celebrate the memory of Pope St. Martin I on April 13. The saint suffered exile and humiliation for his defense of orthodoxy in a dispute over the relationship between Christ's human and divine natures. Martin was born in the Italian city of Tuscany, during either the late sixth or early seventh century. He became a deacon and served in Rome, where he acquired a reputation for education and holiness. Pope Theodore I chose Martin as his representative to the emperor in Constantinople during a period of theological controversy between the imperial capital and the Roman Church. The dispute in which Martin became involved, first as the papal nuncio and later as Pope himself, was over Christ's human nature. Although the Church had always acknowledged the eternal Son of God as “becoming man” within history, some Eastern bishops continued to insist that Christ's human nature was not entirely like that of other human beings. During the seventh century, authorities within the Byzantine Church and empire promoted a version of this heresy known as “monothelitism.” This teaching acknowledged that Christ had two natures – human and divine – but only one will: the divine. Pope Theodore condemned the teaching, and excommunicated Patriarch Pyrrhus of Constantinople for holding to it. Martin inherited this controversy when he succeeded Theodore as Pope. At the Lateran Council of 649, he followed his predecessor's lead in condemning Pyrrhus' successor, Patriarch Paul II, who accepted Emperor Constans II's decision to forbid all discussion of whether or not Christ had both a human and a divine will. Pope Martin condemned monothelitism completely, and denounced those who held to it. He insisted that the teaching which denied Christ's human will could not be glossed over as an irrelevant point. To refuse to acknowledge Christ's distinct divine and human wills, he believed, was to deny the biblical teaching that Christ was like humanity in everything other than sin. The Byzantine emperor retaliated against Pope Martin by sending his own representative to Italy during the council, with orders either to arrest the Pope or have him killed. A henchman of the emperor, who attempted to assassinate the Pope while he was distributing Holy Communion, later testified that he suddenly lost his eyesight and could not carry out the death sentence. In 653, the emperor again sought to silence Pope Martin, this time by sending a delegation to capture him. A struggle ensued, and he was taken to Constantinople before being exiled to the island of Naxos for a year. Those who tried to send help to the exiled Pope were denounced as traitors to the Byzantine empire. Eventually he was brought back to Constantinople as a prisoner, and sentenced to death. The Pope's appointed executioners stripped him of his clothes and led him through the city, before locking him in a prison with a group of murderers. He was beaten so severely that he appeared to be on the verge of death. At the last moment, however, both the Patriarch of Constantinople and the emperor agreed that the Pontiff should not be executed. Although the Pope died in exile, in 655, his relics were later brought back to Rome. The Third Ecumenical Council of Constantinople eventually vindicated Pope St. Martin I, by confirming in 681 that Christ had both a divine and a human will.